Even though it has been a little on the warm side in the city through Labor Day, for the past few days I can say that I have begun to feel the slight cooling of the breezes that feels like early Fall – especially at night time. Because of that I am just going to go ahead and say HAPPY FALL SEASON !! Let the wool sewing begin! Maybe for some of you the wool sewing already started. Maybe for some of you, your Fall winter sewing is done and you are starting Christmas stuff. I ain’t mad at ya, I’m just not as organized. Happy sewing to you, anyway!! So– what did I do for summer? After my Berlin trip this past spring, I didn’t really go far from home for the summer. Took a trip to see family in the Midwest and then came back to NYC. And the answer to the question is YES- I DID GO TO SEE CHARLES JAMES AT THE MET. Everybody and their Grandma, MeeMaw, big Sister, big Mama, and cousin Betsy went to go see Charles James this summer at the Met. And ya know what?? EVERYBODY blogged about it. Or Tweeted it. Or Pinned it. Or talked about it on TV. Goodness me! OF COURSE it was gorgeous, but for a brief moment there I couldn’t read about anything else on anyone’s blog except for Charles James. For the briefest moment it got to be a little redundant reading on the sewing blogs (everyone GUSHING with emotion…), but I DO respect and understand people’s excitement. I am not trying to be snobbish or “Debbie Down-er” in any way about people being excited about the exhibit. I guess I am just spoiled. I had gotten to see some of the dresses before, as they had been on display at various exhibits at the Brooklyn museum or at my Alma Mater F.I.T. over the years. But YES, I was glad to FINALLY get “up close and personal ” with some of the gowns and see a little bit of how Mr James’ creative mind was thinking, and observe his technique, as his glorious creations were artfully deconstructed in the exhibit. That being said—- It won’t be me, but I am sure SOMEBODY, somewhere (maybe cousin Betsy…) is in a sewing room RIGHT NOW draping, and pinning, and shaping interfacing and boning, and will be wearing some pseudo Jamesian “Tree” or “Clover” looking gown for Christmas. To say one of my favorite phrases again… I ain’t mad at ya ! You GO, girl ! Go ahead, strut your stuff, and wear that Charles James knock off, and may the Force be with you !! Merry Christmas ! What else did I do for my summer vacation?? 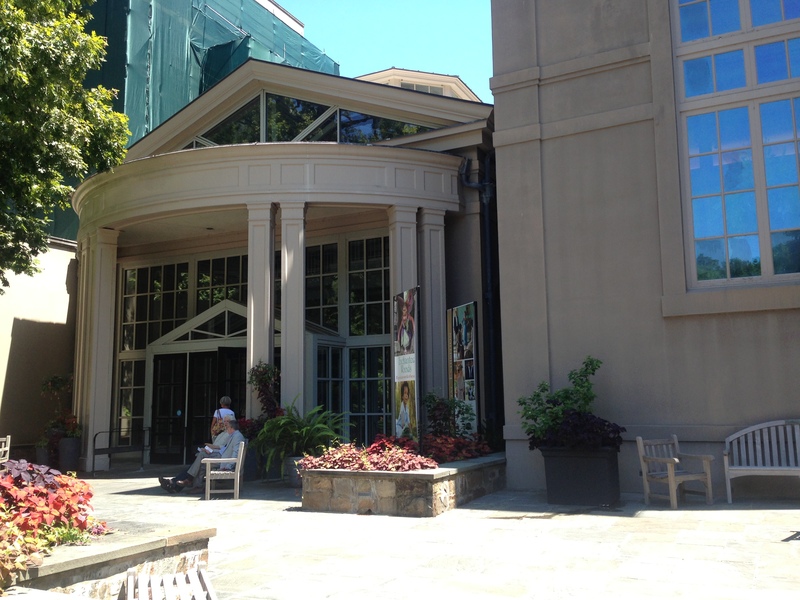 I went to WINTERTHUR !! 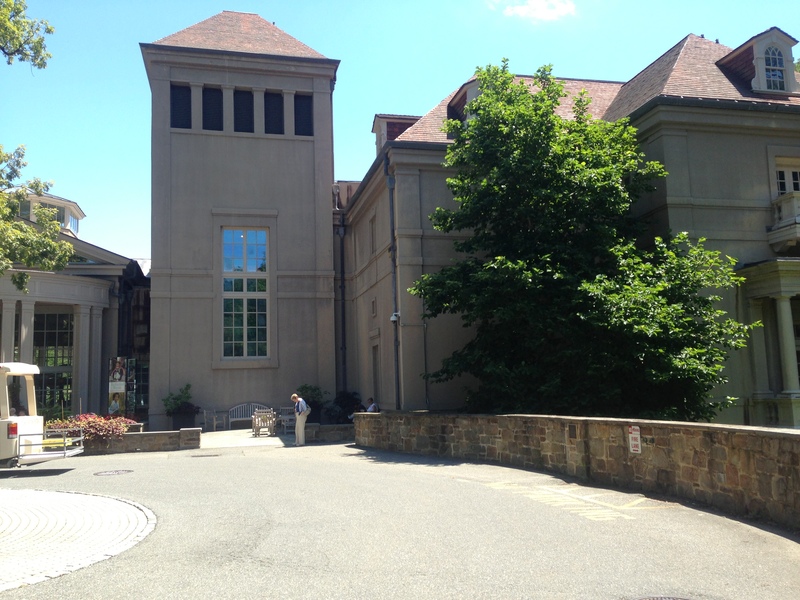 Winterthur ( WIN-TER-TOOR ) is a museum in the Baltimore, MD area that once served as the home of the wealthy DuPont family. In it’s time, Winterthur was a stately, American country home that had both the family economic systems and the servants in place, and did MOST resemble the kind of British country home portrayed in the PBS drama series Downton Abbey. 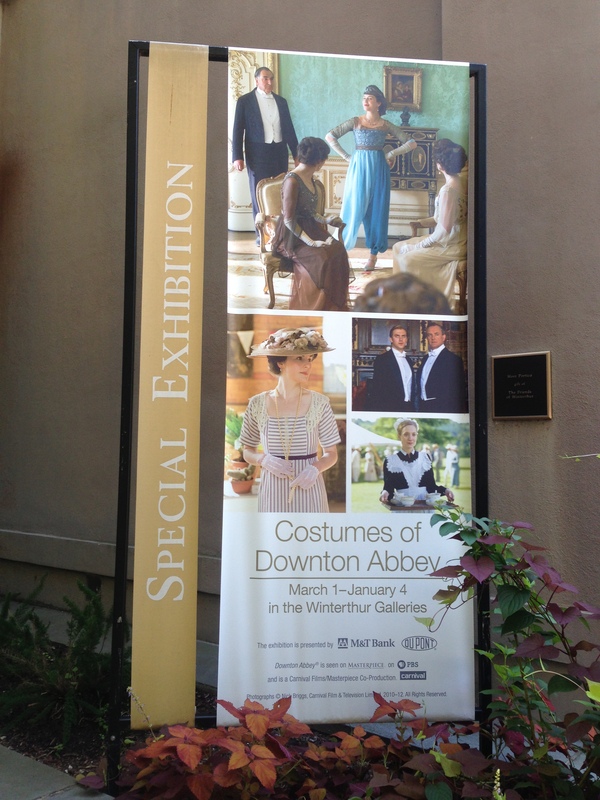 The exhibit at Winterthur consists of many of the key character costumes from season 1 and 2 of the PBS Downton series. If you are a fan of the series, you get to see on display the actual clothes worn by the actors in the film. As a sewing person, it was good to see really good period costuming done well, and the clothes from the series were the focus and the “stars” of the exhibit. But the exhibit also tries to give the viewer information in order to paint a picture of how the Dupont family household( where the exhibit is housed) was a sort of LIVE and almost parallel, Amercan version of the portrayed British family, in the manner of how they lived and carried on a large household with servants. Of course we know that the British royal family, and even the family living in the Castle portrayed as “Downton Abbey”, today, still live in the manner of the portrayed Downton! Some days I wish that was me ! And -oh Yeah-God bless Kate! Pregnant again! 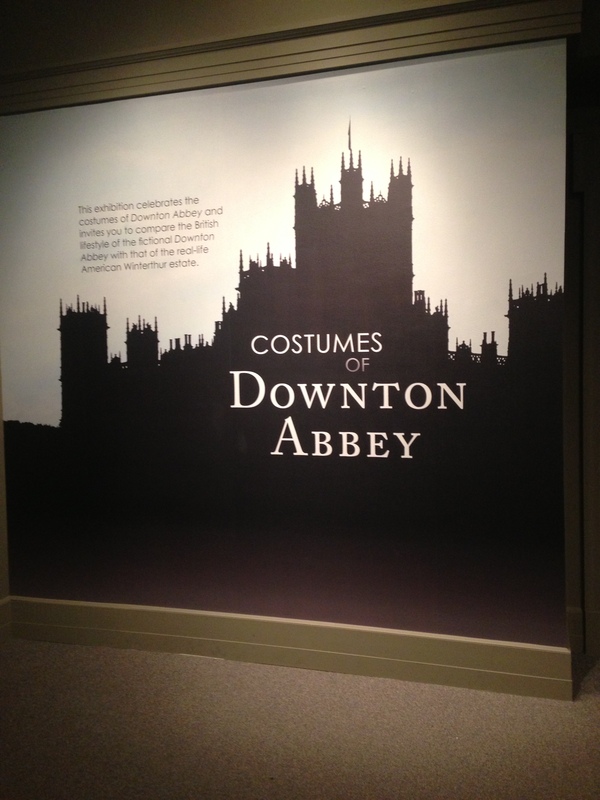 I believe the Downton exhibit is “up” until January 4, 2015, If you are going, YOU NEED TO CONTACT WINTERTHUR AND GET TICKETS TO GET INTO THE EXHIBIT!! The tickets were free, but you do need to get them in order to make an appointment to see the exhibit. Imagine living in this House with servants!! Every Girl’s dream! It was beautiful ! For Cindy and Rosie. The Blue Lace Dress- for a friend of a friend!